The Organization of American States (OAS) and the international organizations of the Joint Summit Working Group (JSWG) signed an agreement today to harmonize their work and make available to the countries their technical, political and financial resources to face the problem of corruption. 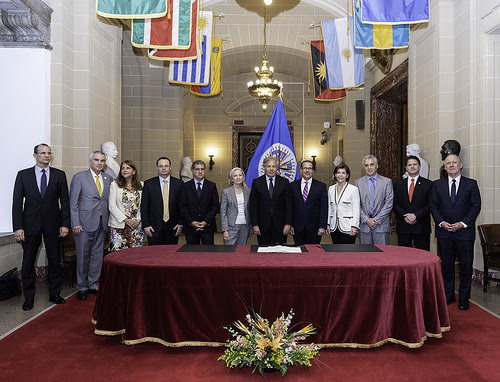 The Secretary General of the OAS, Luis Almagro, highlighted the agreement reached by the countries of the region at the Summit of the Americas, which took place in Lima in April, whose objective is to join efforts in the fight against corruption. "We must respond directly to a phenomenon that weakens the confidence of citizens and hinders compliance with the 2030 Agenda and a series of commitments on which our democracies are based. This agreement seals the commitment of our institutions to continue working together," said Secretary General Almagro. The OAS chairs, through its Summits Secretariat, the Joint Summits Working Group, which is also composed of the Inter-American Development Bank (IDB), the Economic Commission for Latin America and the Caribbean (ECLAC), the Pan American Health Organization (PAHO), the World Bank, the Inter-American Institute for Cooperation on Agriculture (IICA), the Central American Bank for Economic Integration (CABEI), the Caribbean Development Bank, the Development Bank of Latin America (CAF), the International Organization for Migration (IOM), the International Labor Organization (ILO) and the United Nations Development Program (UNDP). The agreement was signed by all, except the Caribbean Development Bank-BDC.